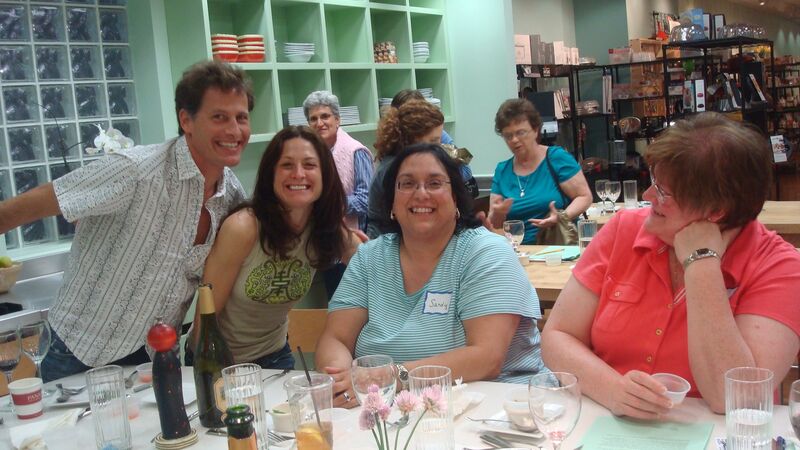 I had so much fun at the cooking class I taught Thursday night at The Bay Leaf. I often feel reluctant to commit to teaching a class – the prep work involved, the nervousness of how it will come off, groping with the different kind of work than I am used to doing. But, now I remember that it’s so much fun because of the people. What a great group of people I had there! And look at the hat that my new friend Gina made for my mom’s head for chemo! Our first ever Sunday brunch starts this Sunday on Mother’s Day. We will be offering a special three course menu from 9 AM – 3 PM: Tropical fruit salad with agave-lime cream & bunuellos, choice of entrée (like Eggs Benedict Mexicano and Chorizo Chilaquelles), and a plate of sweets. Price is $15 per person, not including beverage. We will have coffee, juices, teas, mimosa, sangrita, and other delights. Our normal menu resumes at 3 PM. Hope to see you for this special offering. This is Molly’s mom, thanking Gina for your thoughtful gift! It’s so SOFT and comfortable that I slept in it last night — you don’t realize how hair keeps your head warm until that hair is suddenly gone! And in the morning when it begins to get light outisde, I can pull it down over my eyes rather than groping around for my sleep mask! My Mom went through chemo with breast cancer a few years ago, so I can empathize with what you are going through. Those little thoughtful gifts like the hat mean so much. Hang in there and stay strong. I’ll keep her in my prayers.